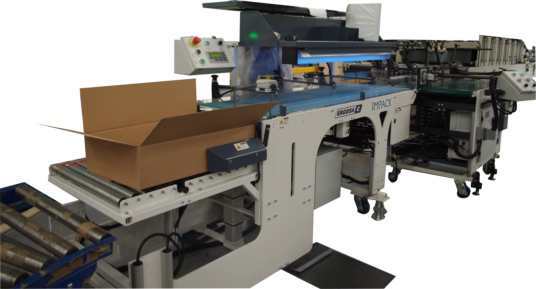 Converters that currently use conventional hand packing methods for their folder gluers can greatly improve their productivity with the use of the ERGOSA Semi-automatic or VIRTUO Automatic packing systems. These units can help increase production speeds, reduce the number of packing personnel, as well as greatly reduce the occurrences of repetitive motion injuries. The ERGOSA semi-auto packer was developed to reduce the number of movements made by the packing personnel with a better ergonomic approach, that removes unnecessary steps, organizes the packing method in more fluid motion and greatly improve the packing personnel’s efficiency. The ERGOSA packing method removes stress from the packing personnel’s joints, tendons and wrist, as the cartons are slid into the case without any lifting. The versatility of the ERGOSA allows packing of straight line, 4 & 6 corner cartons at greatly increased productivity and speed, in multiple layers and rows, as well as the traditional packing of lock bottom boxes. Once the corrugated case is filled by the packing personnel, it is automatically ejected from the packer and can be directed to a case taping system or other conveying system. The corrugated case bottom is not required to be pre-taped prior to packing. The ERGOSA packer can be installed on new and existing folder gluers from any manufacturer at the exit end of the folder gluer compression section conveyor or after various turning modules designed by IMPACK to pre-condition the orientation of the boxes prior to packing. The ERGOSA system is speed synchronized to the folder gluer and job change preparation only takes a few minutes and is normally done the packing personnel. The ERGOSA allows easy access to the individual cartons for quality control checks, is ergonomic, flexible with minimal changeover and capable of high production speeds to answer the needs of today's folder gluer lines. The ERGOSA can be configured with different types of modules and tools to address each customer’s current or future needs. The VIRTUO is a single row, single level automatic packer for folding cartons, micro fluted cartons and some corrugated boxes. The VIRTUO can pack straight line, 4 & 6 corners, as well as pre-alternated lock bottom boxes. The straight through packing approach with the fix feeding, counting and separation section, as well as vertical corrugated case descent, allows for high performances packing from small to very large boxes. 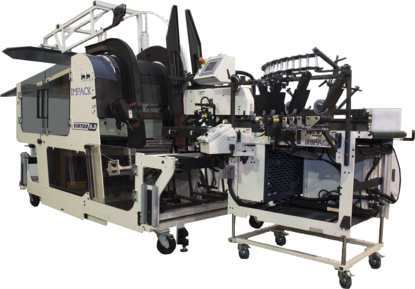 Preparation of the carton orientation is done by various turning devices, manufactured by IMPACK, as needed, prior to entering the VIRTUO packer. The packer can handle corrugated cases with or without top flaps and the bottom flaps do not require taping prior to packing. Empty corrugated case loading is done from the top and the filled cases are ejected automatically from the back of the packer to a taping device or conveying system. An automatic empty case loader with preformed cases is available with the capability to connect to an automatic case former. Job preparation changeover is simple, fast and only takes a few minutes. In addition to its ability to pack medium to smaller size boxes, the VIRTUO excels in the packing of medium to large 4 & 6 corner boxes, as well as, micro-fluted and corrugated reinforced folding carton straight line boxes. These boxes typically packed by two packing persons with great physical effort at relatively slow speeds can now be packed with on only one person at much higher production speeds, with the elimination of repetitive motion injuries. The VIRTUO packer’s straight feeding section, allows it to handle heavier board callipers, micro-fluted and some corrugated boxes without damaging the cartons. PPCTS is IMPACK’s worldwide sales representative. IMPACK specializes in the analysis of work methods and the design and manufacturing of equipment for manufacturers of folding carton, micro-fluted and corrugated packaging. They offer innovative solutions in the area of ergonomics, productivity and workplace health and safety, with a range of products tailored and adapted to today’s folding carton folder gluer manufacturing needs.